The Charis is a patented self-contained carpet cleaning machine for cleaning middle areas of carpet, with several innovative features. With Charis it is possible to perfectly clean a 40cm stripe of carpet, in a single pass. 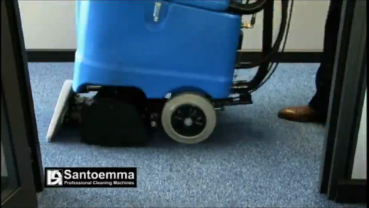 Thanks to its 2 counter-rotating brushes , the dirt is removed from the base of carpet fibres. It is also possible to adjust the brush pressure, according to the type of carpet. 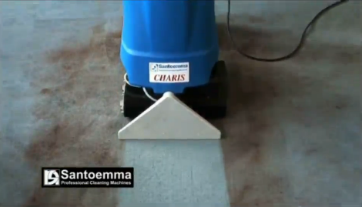 The water-flow can be adjusted, for a maintenance low-moisture cleaning or a restoration deep-cleaning . 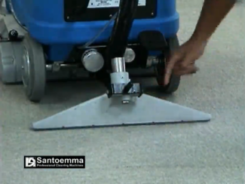 Santoemma high waterlift vacuum system allows an excellent removal of the dirt and a shortest drying time: carpet can be dry in one hour! With only 60 decibel, it is possible to work without disturbing other people. The patented ?click? system allows to manoeuvre the machine in a lightest way. It is possible to work for many hours without effort. With Charis it is also possible to perform a deep pre-brushing of carpet before extraction cleaning, which is useful for very dirty carpet areas.Adding the patented SMARTKIT system, it is possible to perform automatic chemical dosing , carpet pre-spraying and rinsing . 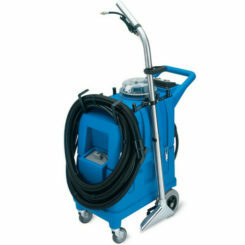 The optional squeegee SQ720E allows to clean hard floor , moving forward. 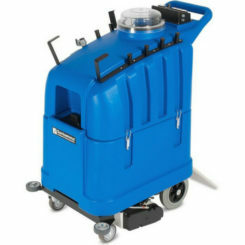 Charis is transformed in a powerful scrubber drier, with 2 cylindrical brushes. Extra brushes, specific for hard floor cleaning, are also available. Main application fields: : cleaning companies, hotels, conference halls, restaurants, clubs, pubs, offices, banks, shops, cinemas, theatres, ferry boats, ships, airports,? fitness centres, school, universities, shopping centres, places of worship and all places with middle-sized surfaces of carpet. After cleaning a stripe of carpet, moving backwards, it is enough to slightly push the handle down and special support wheels will raise the machine, which can easily slide forward to the beginning of next stripe, without any effort for the operator. It is not necessary to bend the machine back towards the operator and push it forward, keeping it in equilibrium on the rear wheels, as happens with all pull-back extractors on the market. With Charis it is also possible to perform a deep pre-brushing of carpet before extraction cleaning, for a deep mechanical brushing action.? Normally this operation requires a dedicated machine, such as a single disk. With Charis everything can be done with just one machine. Adding to CHARIS the patented SMARTKIT system, it is possible to perform carpet pre-spraying with concentrated chemical solution, automatic chemical dosing and carpet rinsing . ?The chemical is put as concentrated in a bottle and the machine?s tank contains clean water only. 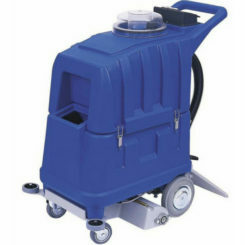 When chemical injection is required, the machine automatically sprays chemical in an optimal concentration, either during carpet extraction cleaning or in carpet pre-spraying. During extraction cleaning with chemical, a controlled chemical concentration is ensured, with no need for the operator to perform any dilution. Wrong chemical concentrations and waste of chemical are avoided. Using a dedicated pre-spray hose and gun, it is possible to pre-spray carpet with a concentrated chemical solution. Pre-spraying carpet with a concentrated chemical solution allows a longer dwell time for the chemical, which helps detaching the dirt from carpet fibres. With SMARTKIT, it is possible to let the machine work with clean water only, in order to rinse carpet fibres, removing any sticky chemical residual and ensuring a slow resoling after cleaning. Great cleaning power, thanks to the 2 counter-rotating brushes , which allow to clean the carpet fibres deeply and from all sides. No residual dirt will re-emerge on carpet surface after few days! The 3 stages high waterlift vacuum motor and the special profile of the vacuum head allows an excellent? suction and therefore a complete dirt removal and a very short drying time. Very silent working (60 decibels), allowing to use the machine with no discomfort for the worker and for other people. The machine can be used also during normal daily working time and in noise-sensitive places such as hotels, offices, banks. The patented ?click? system allows to work with the machine for many hours without any effort for the operator. Possibility to adjust the height of the brushes according to the kind of carpet and to the dirt degree. Possibility to pre-brush carpet, useful for particularly dirty areas. Controls at a comfortable height for the worker. Water spraying can be continuous or otherwise activated by the machine handle. Possibility to connect the machine with optional tools for cleaning hard-to-reach corners. Possibility to regulate the water flow, according to the degree of dirt and to the desired drying time. With the optional SMARTKIT-CH , it is possible to perform automatic chemical dosing and carpet rinsing. Adding the pre-spray pipe and gun PRESPRAY-MX to SMARTKIT-CH, it is also possible to pre-spray carpet before cleaning, in order to get the best cleaning results and avoid fast resoling of carpet. 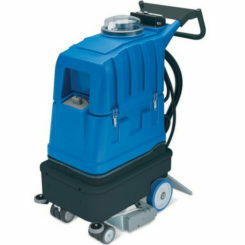 Possibility to clean both carpet and hard floor with a single machine, by using the optional squeegee SQ720E. The squeegee is connected to the machine thanks to a quick disconnect coupling which does not require to use any tool. Water pump with internal bypass, which allows an automatic regulation of the optimal water flow according to the tool used. Moreover, the bypass device makes the pump more reliable and avoids problems in the years. Brush motor with thermal protection against overload and excessive mechanical action on carpet (useful in case of a wrong ?regulation of the brush height).